This started a few weeks ago over on Jen's blog. And then, we had the brilliant idea that, you know what? Sometimes a girl just needs to brag. There are link ups for just about everything else amIright? So, in a blogworld joining of forces with Jen at That's What She Read, Jess at Tooth N Nails, and Mallory at From California To Kansas we will be hosting a new link up every Monday! We are so excited about it, we hope you'll join us in #BragAboutIt! Please grab the button code below to insert into your post, and get your posts ready! 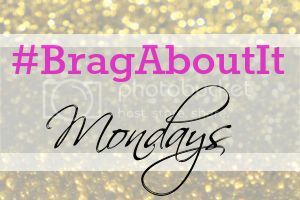 Our official #BragAboutIt Launch will be Monday December 3rd! Please be followers of the hosts, Jen, Jess, and Mallory and please interact with 1 or more of the bloggers that link up! What a fun linkup - love that button too! Happy weekend! This is a fun idea! I'll have to do this soon!